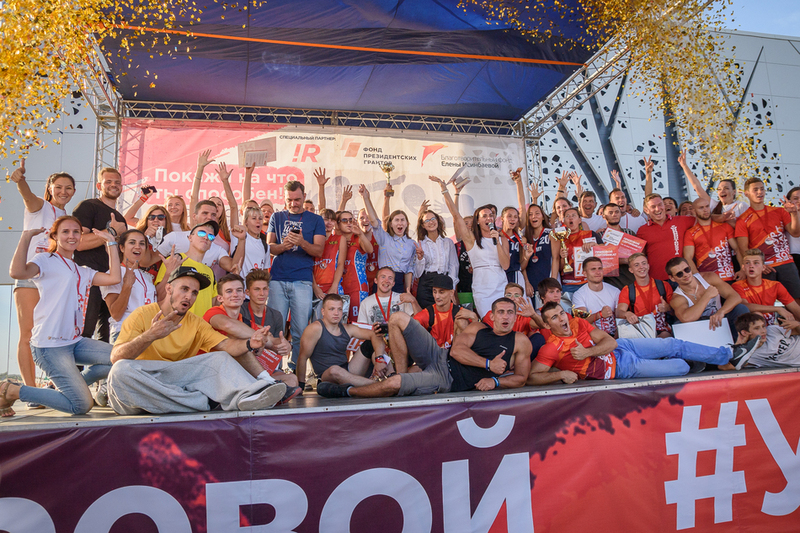 For the first time Yelena Isinbayeva Fund with support of the Fund of Presidential Grants and its special partner Igor Rybakov organized a major Russian festival of street sports such as parkour, workout and 3x3 streetball. The two-day festival was organized on the territory of the Russian History Museum in Volgograd. Two hundred participants from 13 regions of the country came to take part in the Volgograd competitions. Every registered participant was given a starting kit with gifts and souvenirs from the fund (a t-shirt, a participant number, a shaker, a bottle of sports water, a sticker pack and a power bank). The festival event that attracted most of the participants was streetball: 26 men’s and women’s teams took part in the festival. Most of them represented schools and universities. Sixty strongest athletes had registered for the workout event and competed in two programs: battle and base wars. The performance of tracers in the parkour event was also extremely spectacular. Thirty young men and women from 12 to 30 y.o. amazed the spectators with their jumps and tricks. Beside the sporting program, there were numerous interactive activities at the festival: graffiti, street dance, freestyle rap, photo zones and photo printing with a hashtag of the event #StreetSportFest, music performance by a cover group “Kakaya raznitsa” (Whatever), a carton-made maze for children, a show of foam clouds and activities organizers. As a result of two day competitions 39 winners were chosen in all the events. 1 place – Team of the Volgograd State Medical University: Svetlana Eroshkina, Ekaterina Mukhina, Alyona Min and Daria Udovenko. 2 place – Team of the Volgograd State Technical University: Ekaterina Schipanova, Irina Lomakina, Viktoria Dzhashi and Maria Blinova. 3 place – Team of the Volgograd State Academy of the Physical Culture: Anna Dubina, Daria Prorokova and Anastasia Shalimova. 1 place – « Motiv » team: Egor Rybalkin, Mikhail Lagutin, Dmitri Tsukanov and Kirill Sadikov. 2 place – Team of the Volgograd State Technical University: Aleksandr Rudenko, Aleksandr Romanov, Ivan Alimov and Roman Evchits. 3 place – « Gernika» team: German Kopkov, Igor Ten and Dmitry Poyarkov. The winners of the first place received official medals, cups, certificates, gifts from the fund, money prize from the fund’s special Partner Igor Rybakov in the amount of 21 thousand rubles and a book “Zhazhda” (“Thirst”). The winners of the second and third place were awarded with medals, certificates, gifts and money prizes from the special partner Igor Rybakov: 15 thousand rubles for the second place and 10 thousand rubles for the third place. The best athletes also received the book “Zhazhda” from Igor Rybakov. Yelena Isinbayeva fund received a great number of positive comments from the participants of the festival. They thanked the fund for the attention it pays to the development of street sports and for the organization of a great festival with valuable gifts and prizes.